2) What inspired you to create, ‘Comics for a Strange World’? After I created my first book, I knew I had to do another one as soon as I could. My work exists mainly on the internet, so getting to hold my book firmly in my hands is a very cool experience. It’s also a particularly ripe time for social and political satire, so a lot of the new material in this book was created with that in mind. 3) In your own words, how would you describe this collection of comics? An absurd satire of a world similar to our own. 4) What song would you say best represents this piece and why? “Super Triangle” by The Go! Team. 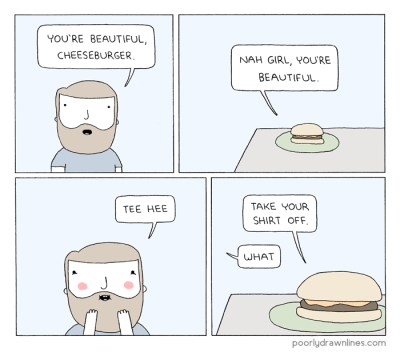 I don’t know why, but it feels right somehow. 5) If you could get a celebrity – either living or dead – to promote your work, who would you choose, and why? Kurt Vonnegut, so I could buy him a beer afterwards. His work has been a big influence on what I do and I’d like to see how long I could last in a conversation with him. 6) During your time in this field, what is the one thing that has kept you in good stead? Getting positive feedback from my audience, or any kind of feedback for that matter. It's satisfying to see people react to my work and take something away from it. 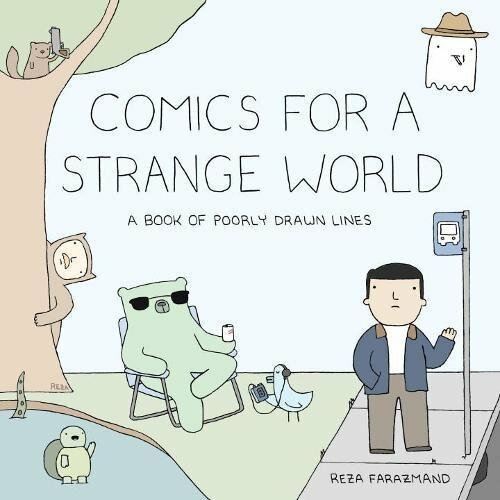 And on that note, I'd like to thank Reza for telling us about his new book, ‘Comics for a Strange World’, before directing you towards his website, facebook, and twitter pages. And while your at it, why don't you pick yourself up a copy either online or via your local retail outlet? Trust me, it's a really funny 208 page paperback, and well worth the £10.68 price tag.